This new Subaru Ascent closely resembles the Outback wagon, except that it is larger and more robust. It is the replacement to the three-row Subaru Tribeca that was cancelled back in 2014. It is Subaru's largest ever vehicle, perfect for big families with the seven or eight available seats. There are four available trim levels as of writing: the base, Premium, Limited, and Touring. This vehicle is direct competition to the Honda Pilot, Volkswagen Atlas, and popular Toyota Highlander. 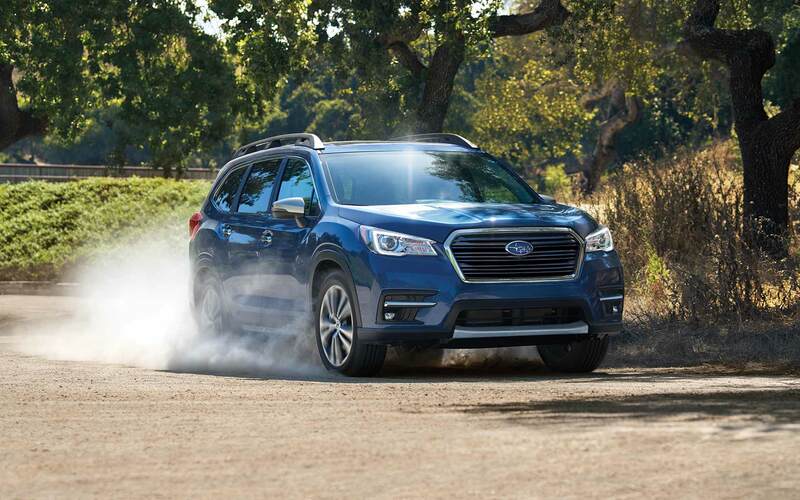 For information about purchasing the 2019 Subaru Ascent near Thornton, please contact Flatirons Subaru serving Thornton Colorado. As mentioned, there are four available trims: the standard and three upgrades. Standard on the base model is 18-inch allow wheels. The Premium edition features a programmable power rear liftgate. On the Limited edition, there are full LED headlights and LED fog lights, as well as keyless entry and start. The Touring edition provides a panoramic sunroof (that limits storage capacity but is a nice touch for long road trips). All of these features are also available on the standard trim, through upgraded packages. This family SUV is Subaru's largest vehicle, and closely resembles their Outback wagon, except for being larger and shapelier. The roof rails are also set to handle the weight of a roof tent for serious off-road adventure potential. Beige plastic coats the dash and doors inside this new Subaru Ascent on the base model. For the Touring trim, the vehicle comes with low-gloss wooden trim, leather seats, and leather coverings across the interior. Within the vehicle, there are a whopping 19 cupholders, a conversion mirror that gives the driver sight over all the seats in the car, tri-zone climate control, four USB ports (up to eight in the upgraded models), and all seats are resistant to spills and other liquids. Available on the higher trims is a 4G Wi-Fi hotspot, front seats with ventilation, and a rear-view camera that is always on. The standard multimedia system is run through a 6.5-inch touchscreen. On the higher trim models, this is upgraded to an 8-inch screen. All models come standard with Android Auto and Apple CarPlay. 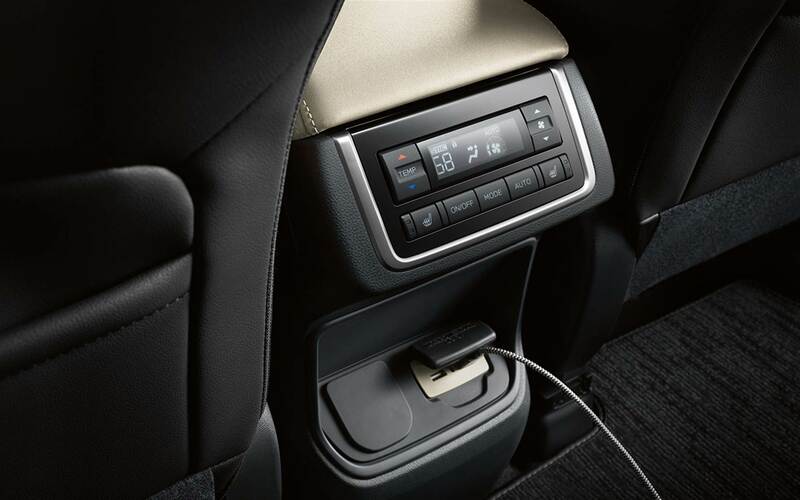 As for the available entertainment packages, Subaru offers the Entertainment Anywhere Package. This configuration comes with two iPads and two headphones. The interior is roomy, with seats that slide forward and backwards, as well as recline. These seats also allow for three car seats across, for the ultimate children-driven vehicle. The third-row seats are easily accessed because the second row has a serious sliding function that creates a massive path to walk through. With the third-row seats in use, there is an available 17.8 cubic feet of storage capacity, which is easily upgraded by folding this row down. The powertrain outlined below grants the car a 0-60 burst of 6.9 seconds. It can haul up to 5,000 pounds of payload in the Premium trim (with 2,000 pounds of towing potential for the base model) with the available Class III trailer hitch for true towing potential. The vehicle is great for off-roading over sand, rocks, and dirt, thanks to the 8.7 inches of ground clearance and standard X-Mode AWD system. X-Mode will automatically modify the engine, transmission, and braking when the vehicle detects adverse road conditions. This Ascent feels sturdy, thanks to the flat-four engine's position being low in the structure. This means that there is no wobbling and the drive is smooth. Steering in this vehicle is super responsive and requires little input for smooth sailing. Overall, the mechanical components of this vehicle serve the needs of a large or medium-sized family, or even those of adventurous teens looking for outdoor adventures thanks to the large storage capacity, towing power, and sleek design. 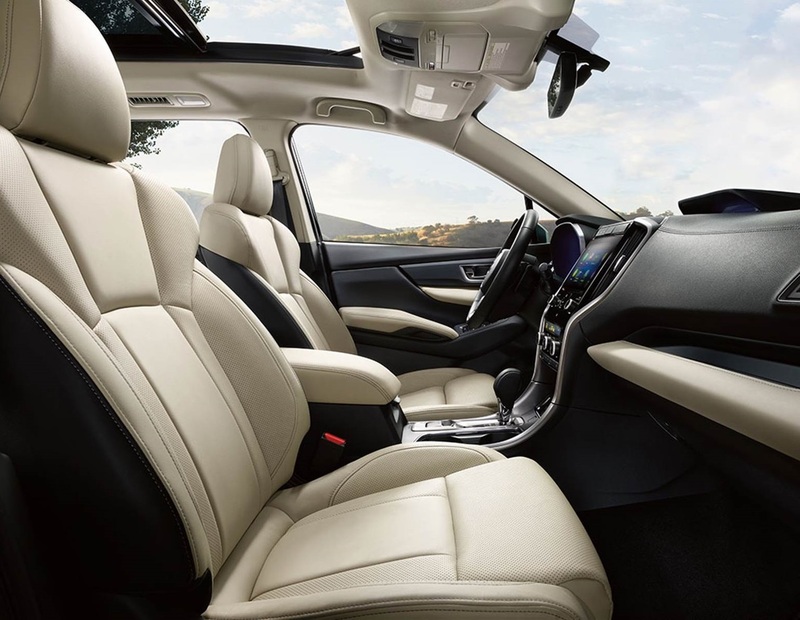 For more information about the mechanics of this new 2019 Subaru Ascent near Thornton, contact your friendly team of dealers serving Thornton Colorado. This 2019 Subaru Ascent is run by a turbocharged 2.4-liter four-cylinder engine with 260 hp and all-wheel drive. This marks Subaru's first usage of their 2.4-liter turbo flat-four in one of the offerings. There is quite a bit of torque in this vehicle, at 277 lb.-ft, with power bursting through without any hesitation. Subaru says that regular gas is perfectly suitable for this vehicle, in place of the premium asked for by many turbo engines. The base models' ratings for gas mileage include: 21 mpg city, 27 mpg highway, and 23 mpg combined. 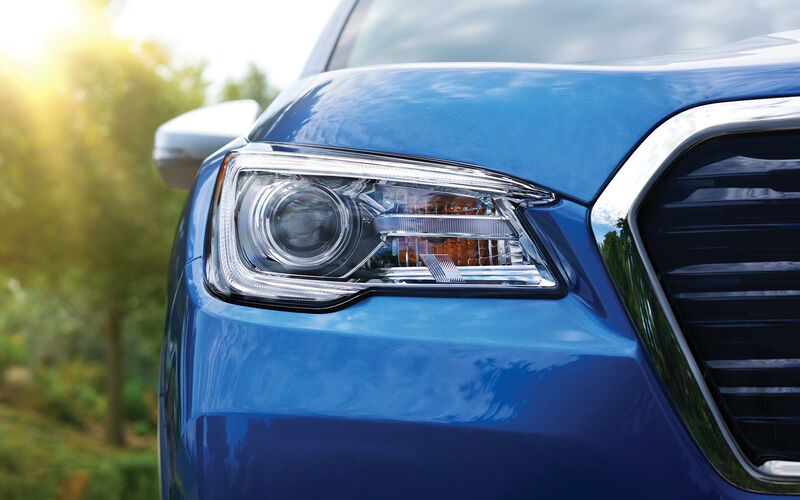 The base model features all-wheel drive and Subaru's EyeSight safety and driver assistance system. This includes forward collision warning, automatic emergency braking, lane departure warning, and automatic cruise control. The Premium model offers blind spot warning, lane change assist, and rear cross-traffic alerts. 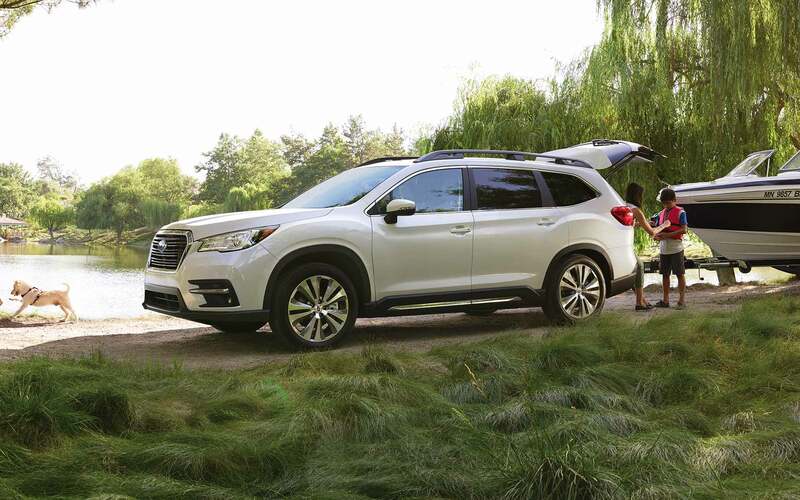 Buying a 2019 Subaru Ascent couldn't be easier when dealing with Flatirons Subaru, serving Thornton Colorado. They make the buying process fun and easy and can answer all of your questions about this new Subaru Ascent. All of the car's highlights mentioned above are purely for information's sake. If you want any more details about any of these features, please contact the dealership today and schedule and appointment to come see the SUV or take it for a test drive. It is the perfect family vehicle, so bring your children along and let them take a spin in your new home on wheels.